Welcome to AICOM web site. Here you will find a complete product and service which will allow you to create a vision applications. 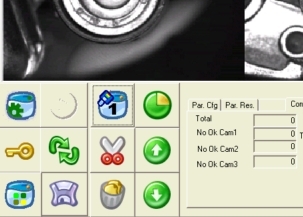 A Machine Vision Application Builder software, a complete Hardware device, and our guide and tips : you only start Aicom Program, focus the camera and.. from our no-need-keyboard visual workspace you will be able to make your application, debug in real-time and get results to your machine. We have an in-house R&D department, we are also able to connect you immediately to our development team. For your specific technical needs, be sure to check the Aicom Solution Software, or we can develop a quick adapter for your needs.